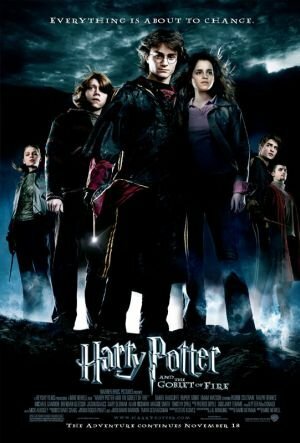 Harry finds himself mysteriously selected as an under-aged competitor in a dangerous tournament between three schools of magic. Series and book spoilers. -Ludo Bagman and the gambling, debt, twins trying to shake him down, and Harry giving them funds. -"DID YOU PUT YOUR NAME IN THE CUP?!" -Explanation of the events leading up to Voldemort's return. The dorm room "you saw your parents" thing felt so empty. ‘Did you put your name into the Goblet of Fire, Harry?’ Dumbledore asked calmly. Everyone needs a haircut in this movie. Eh. Everyone freaks about that scene. I don't have a problem with an actor giving his own spin on a character. So if he (or the director) wanted to change calmly to angrily, so be it. What I do have a problem with is poor execution, and that scene was... not good. This was my least favorite movie until my last rewatch. I hate the teen angst, though it's sort of inevitable. That mostly ends after the first hour and it turns into a decent movie. Even if the whole tournament idea is asinine. The thing with that scene is that although it's never said outright, Dumbledore is like a ninth-level grandmaster legilimens. So every time he talks to Harry he's looking intently at him and rummaging around in Harry's mind, which is one of the reasons he always knows what's going on. The way he does the line in the movie doesn't convey that at all. It's more like a stern but oblivious parent. The scene with Dumbledore in the Gryffindormitory is extremely unsatisfying. That's going to become a theme from here on out in the movie series: endings less satisfying than the book. I know the argument is that Dumbledore and Harry just sitting and talking for fifteen minutes isn't cinematic, but I'm sure it could have been done at least a little better. If people were willing to sit through "My Dinner with Andre" they'd certainly sit through "My Debriefing with Harry". "My Dinner with Albus" - I'd watch it. "Did you get an older student to put your name in the cup?" "No! ...... wait, would that have worked?"